The CNX Nifty on Thursday gained 34.75 points or 0.57% to close at 6091.85 points, while the S&P BSE Sensex rose 114.65 points or 0.56% to close at 20,534.91. The markets closed the series with a monthly fall of 3% after witnessing a rise of nearly 14% in the earlier two months. Analysts said foreign institutional investors (FIIs), who rolled over long positions on expiry of the September and October series, unwound their bets during this expiry. “The fall in FIIs’ positions can be linked to the likelihood of higher volatility in December because of the state election outcome,” Traders do not expect the Nifty to fall below 6,000, going by the position build-up in put contracts in the strike. The Nifty rose 0.6 per cent to close at 6,091.85 on Thursday. Nifty December futures rose 0.7 per cent to close at 6,160.
never trade on speculation never trade without Stoploss order ..
First article url http://dhanvarshagrp.blogspot.in/2009/11/technical-indicators-always-help-you.html posted on 29 Nov 2009 .
kailash123p@yahoo.co.in (11/28/2013 3:07:41 PM): 13 to 33 ? kailash123p@yahoo.co.in (11/28/2013 3:08:00 PM): on my call ? kailash123p@yahoo.co.in (11/28/2013 3:08:56 PM): qty? nifty will trade with increased volatility today’s move will be controlled by big option players /market operators so advised to trade fast quick entry and profit booking will be gud …keep wide stoplosses . negative to gape down opening is expected with possibility of extremely volatile session ahead . Till nifty is trading below 20 dma and trading in lower bollinger area Nifty will remain in bears grip and trade according to bearish pattern ..
Gap down opening is expected with extremely volatile session ahead. SGX Nifty is trading below 35 40 points http://www.investing.com/indices/india-50-futures-advanced-chart its trend is neutral at this point and may move in any direction means negative or positive .so be cautious and book profit in your stbt position first . Do not hold your position on speculation like it may get support here or it will make double top and take U turn ,it may take turn from fib level …these speculations may or may not work …best is trade with stop loss punched you may re enter in same trade if moves in your direction again with stop loss order. [×] [o] Abhay: Todays gains till now.. 6K.. All trades on Admin sirs instructions.... Thank you Admin sir..
please note these all levels are sell below and buy above levels depending on market price action and level at particular time supppose at 1400 Hrs NF is trading at 6115 and tends to move up in such case call will be buy at and above 6113 sl 6089 for targets 6246 – 6165 – 6182 and so on so do not think that why we are advising to buy at low . chunnu sa …spinning top at 200 DMA in bank nifty ..will we expect reversal confirmation I mean long red candle today ?? market on 20 choppy or bearish ? 50% retracement was expected above 5972 but it has moved up to 61 % retracement level due to panic SHORT covering ..still trading below 20 DMA, if failed to breach 20 dma and 61 % retracement level 6189 ..possible near term move 5750 can not be ruled out as per corrective e wave 3..learn more about Elliott waves more buying with volumes may take it up to 6265 level …respect 6202 spot for going long /short below 6158 panic selling can not be ruled out. is 40$ move in less than 12 hours is not enough ??? sgx nifty daily cart is showing that NF is trading between 38.2 and 50 % retracement levels . above 6185 nify may move towards 6240 50 below that 652 6080 5970 . Trade according to levels … consider all levels as buy above and sell below depending on price action .if NF fail to cross 6198 and you will find profit booking signals or weak-ness you may sell NF at or below 6198 keeping stoploss at 6218 for targets 6181 >>>6162 >>6145 and so on same when trade at lower levels suppose trading at 6106 and buying seen you may go long at 6106 keeping stoploss at 6087 for targets 6126 6145 6162 …so at any level seeing buying or selling you may plan your long /short trade for intraday trading . Wall Street approved of Yellen’s performance by boosting every market following her appearance on Capitol Hill. Notably, Yellen said little to suggest the Fed would cease bond buying — known as quantitative easing — until signs of recovery were undeniable. Looking for gap up with range bound trades ,nifty may trade in short range of 40 points and stay in non trading mood whole day as it will be trading in traders action zone after 360 points steep fall in 8 days ( Fib Number ) from its recent all time high . Flat to negative opening is expected with possibility of choppy session with confusion ahead because nifty closed at 22 % retracement level 6079 which it self a pivot level also . About support at 6080 informed on 10 Nov at http://dhanvarsha.in/trend-lines-indicating-nf-levels/ “as per eod chart bias is bearish fib support is 6080 if selling with volumes will be there 5950 5872 will act as 50 DMA and fib support…Money flow index is showing that money is going out ” ….Technical indicators are working properly and market is following them …there are two ways to clear 6079 level either by gap down of 15 to 20 points or selling with volumes so wait and watch for next move …only one hope for bulls is pivot level …will it help them enough ?? this 5 hour sgx Nifty chart is showing that Nifty futures are having no support till 6000 level …so advising to stay short with positional trade advised to sell at 6360 trail with sl 6196…. 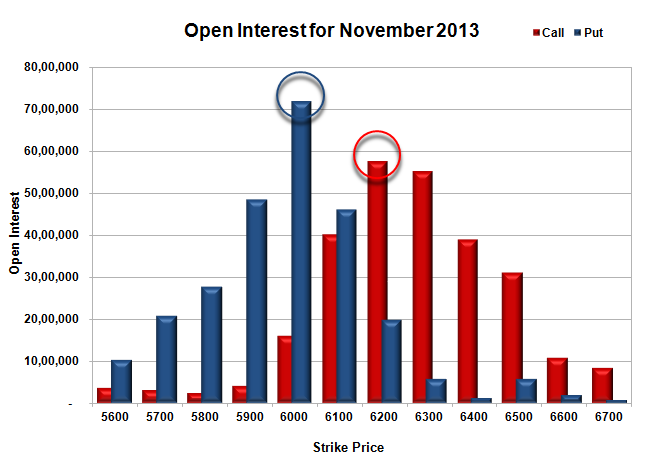 11 Nov 13, 01:39 PM [×] [o] admin: have u gained on pe 6100 from 64 to 72 ?? later traded at 86 …. Abhay (11/10/2013 6:46:50 PM): Ok…. 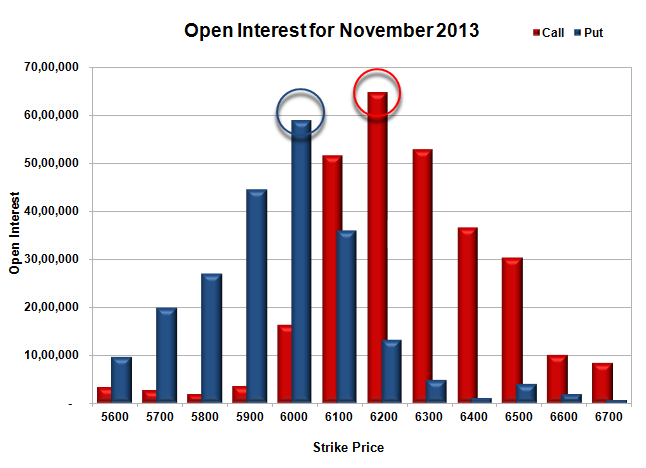 Abhay (11/10/2013 6:47:52 PM): Can we trade Put like TATA motors..? Abhay (11/10/2013 6:49:12 PM): When..? 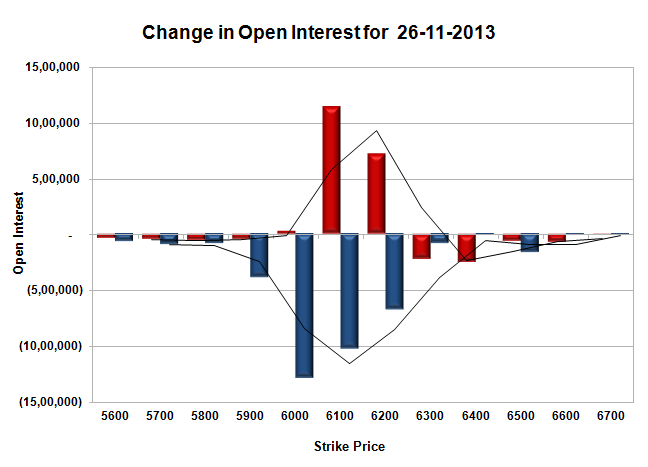 Abhay (11/10/2013 6:52:47 PM): Hmmm..
Abhay (11/10/2013 6:54:29 PM): Do u see gap-up opening tomorrow.? like usual monday..? OR Is it Blood bath all the way..? Abhay (11/10/2013 6:56:32 PM): Ok..
Abhay (11/10/2013 6:56:53 PM): So.. generally the action is between 230 & 3..? kailash123p@yahoo.co.in (11/10/2013 9:12:11 PM): : At least a dozen large banks from the US and Europe have come under scanner in a global regulatory probe into suspected manipulations in forex markets, with some of them being investigated for possible manoeuvring in over USD 50-billion a day rupee trade market. http://zeenews.india.com/business/news/international/global-forex-probe-ensnares-banks-like-barclays-hsbc-jp-morgan-and-others_88559.html These include Goldman Sachs, HSBC, UBS, Deutsche Bank, Barclays, RBS, Citigroup and JP Morgan and they have said in their respective regulatory filings that they are cooperating with the relevant authorities in the investigations. Gap down opening is expected with increased volatility …stoploss for positional short will be 6231 maint ur short position below it advised at 6360 70. FIIs sold Index and stock futures more than 1300 Cr either short sell or long unwinding …be cautious..
Trade with stoploss punched in system and according to trend ..